Slice the apples about 1/4 inch thick, horizontally. Group the slices into pairs that will be used to make the little sandwiches. For those slices where there is very little core (small enough to just eat), spread peanut butter over the entire slice. Cut a heart-shape (or any shape) out of the other slice, taking out its core. Place it on top of the slice with peanut butter. Add a dollop of jam inside the cut-out, and spread to cover up the cut-out. For those slices where the core is too tough to eat, use a cookie cutter to cut the core out of both the bottom and top slices. Spread peanut butter over the bottom slice. Take a piece of fruit leather and place it over the hole, and top with the top apple slice. 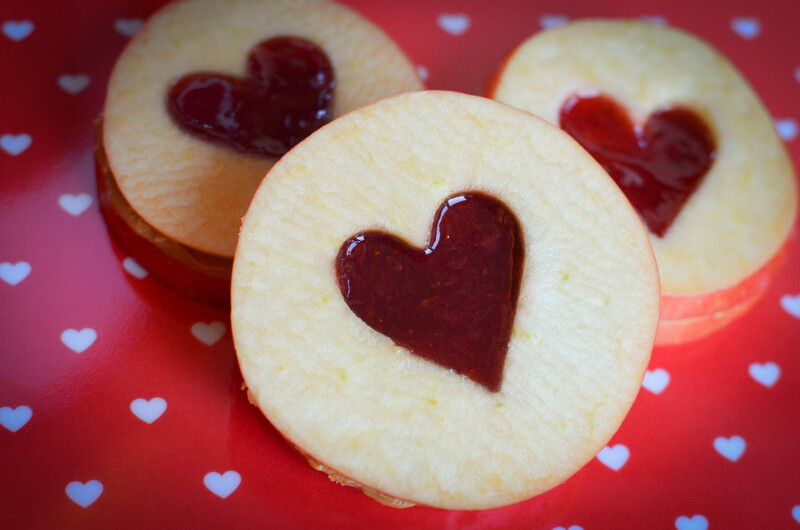 Add a dollop of jam inside the cut-out, and spread to cover up the cut-out.